The Fleece Inn01535 642172work InnThe Fleece Inn is situated on the picturesque and historic, beautifully cobbled Main Street in Haworth. Staying at the Fleece Inn, the original Inn where Branwell Bronte, brother of the famous Bronte sisters once drank is a relaxing and inspiring break. Sticking to the basic principles of offering fabulous accommodation, unrivalled service, excellent food in a friendly, relaxed atmosphere. The Fleece Inn and Restaurant offers time honoured Yorkshire hospitality in traditional and comfortable surroundings, with easy access to all the best places to visit in Haworth. The full range of Timothy Taylor's award-winning cask ales are served in the stone flagged bar, which also stocks a comprehensive range of wines, bottled beers from around the world and malt whiskies. The Fleece Inn are current holders of Beautiful Beer Gold and Platinum awards and are featured in the Good Beer Guide 2010. 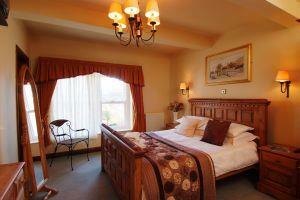 A former coaching inn situated in the heart of Bronte Country providing 7 high-quality en suite bedrooms. Free wi-fi available Children welcome from any age. Take the A629 into Keighley and follow this road through the town centre. Keep on this road (Haworth is now signposted) until you meet a mini-roundabout adjacent to the public house called The Crossroads. Turn right onto the A6033 and follow this onto the B6142 into Haworth. Passing the station the road bears right and up the hill. On the left a cobbled road bears left - this is Main Street and the Fleece is 300yds on the left hand side. Buses 663/4/5 from Keighley bus station. Stay on the bus past Haworth Railway Station and Spar, up the hill, until the road bends to the right. Get off at the next stop and walk up the cobbled Main Street. The Fleece is 300yds on the left hand side.